The best part about this meal at The Boardwalk was the service.Whoever wrote the Restaurant Week menu should have notified the chef of what was on it. Right off the bat, things didn’t start off the greatest. There is an upstairs and downstairs, and what I didn’t know before getting there is that they each have their own kitchen and menus. 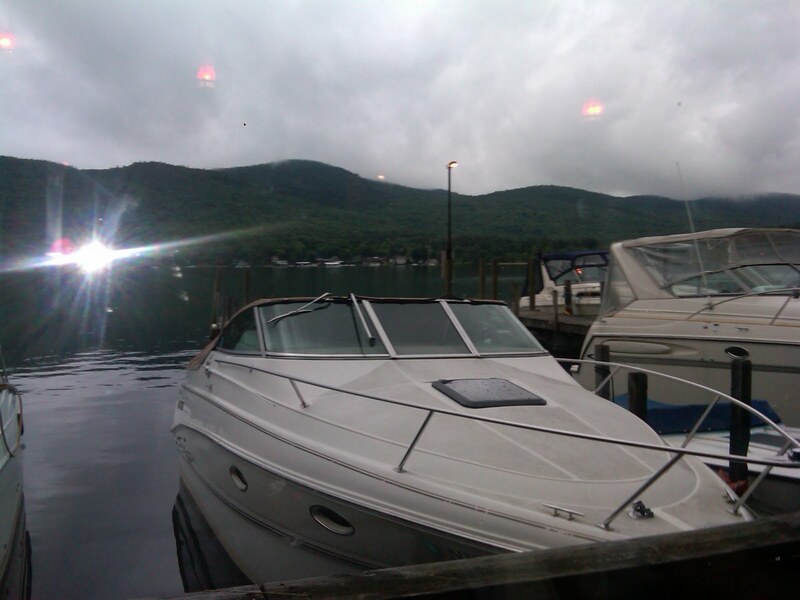 The upstairs (where I wanted to sit) has beautiful, open panoramic views of Lake George. The downstairs has OK views, but they are water level, looking through glass and are not as open as the upstairs. The upstairs, however, did not have the Lake George Restaurant Week Menu, so we opted to dine downstairs. 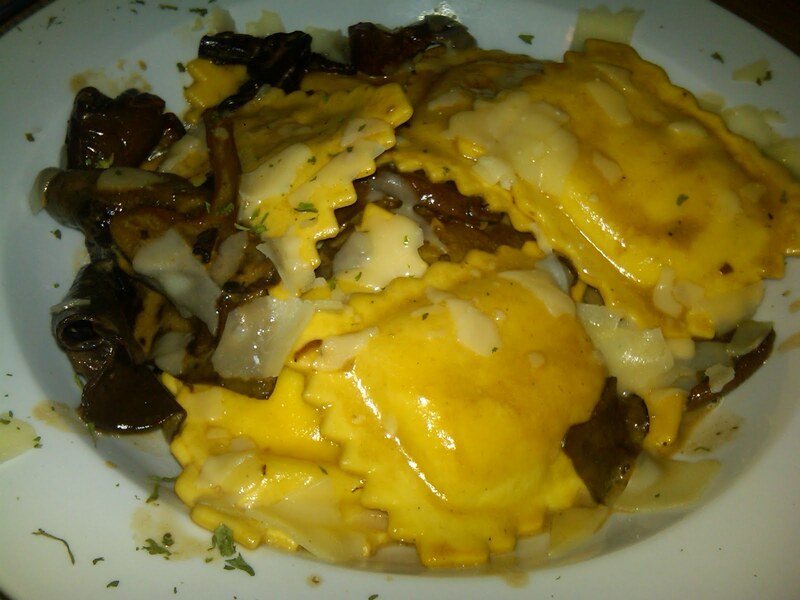 It seems like many of the Restaurant Week items weren’t on the regular menu, and I was really looking forward to trying their three cheese, grilled eggplant and wild mushroom raviolis. Here is the description: Six extra large homemade raviolis filled with marinated and char-grilled eggplant, braised wild mushroom medley, Fontina, Asiago and Pecarino cheeses and kissed with a very rich vegetable and wild mushroom stock reduction cause finished with cream sherry and garlic butter. What I got: Cheese filled raviolis with two pieces of steamed eggplant on the bottom of the plate with a light broth-based mushroom sauce. The raviolis weren’t filled with anything but cheese. I didn’t say anything to the waitress, because I thought maybe I read the menu incorrectly. Don’t get me wrong, it was very good and I ate most of it, but it wasn’t exactly what I was expecting. Reading the description of the chicken item — sauteed medallions of fresh chicken breast served in a demi glaze with cracked black peppercorn, cream, conac and a wild mushroom medley served with choice of potato — I figured my Dad would enjoy it, so I invited him out. He said the chicken was cooked great and was good, but he was not impressed compared to the description. 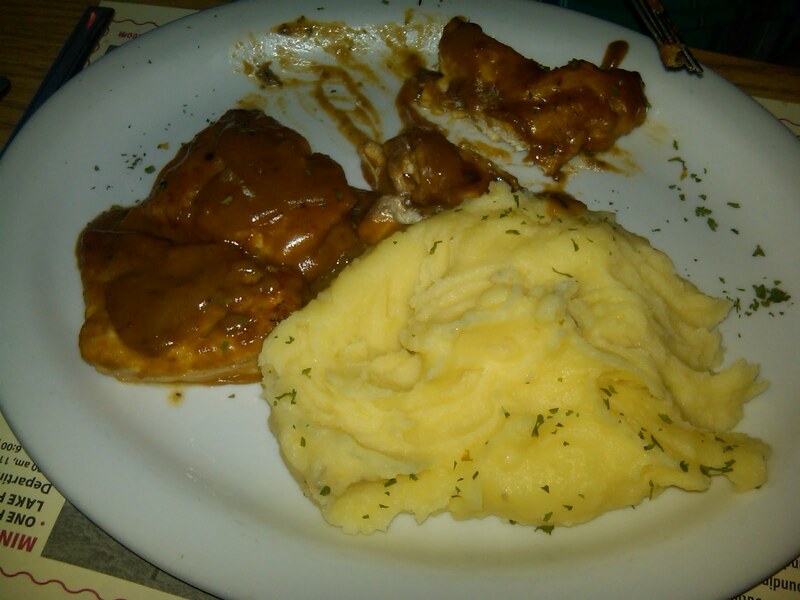 About the sauce: “It tastes like a doctored brown gravy.” About the garlic mashed potatoes: “The boxed ones have more flavor.” And, there was no mushrooms on his chicken. Dessert, too was a little disappointing. 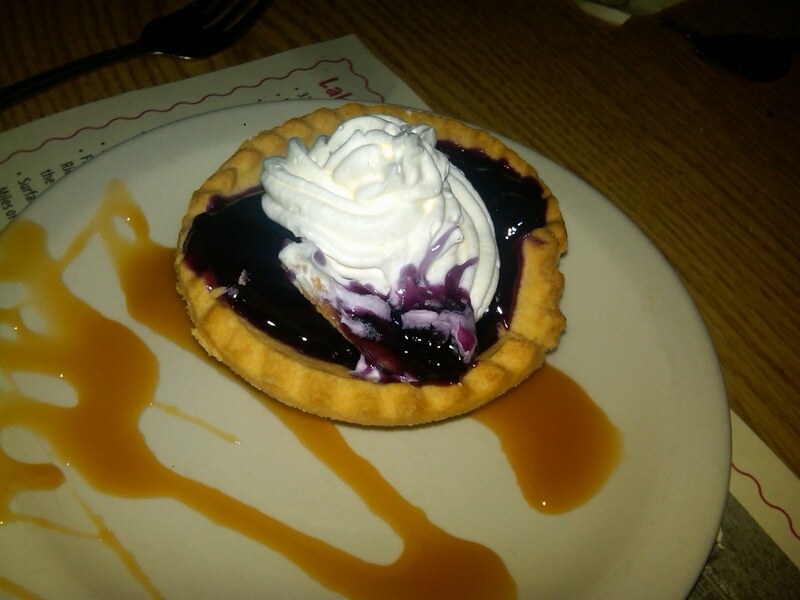 My blueberry tart was nothing special. The crust tasted like it was just taken out of the freezer and the blueberry filling was the same as I get out of a can. My Dad commented that his triple chocolate mousse pie was like the frozen ones you get at the supermarket. What we should have done was just stopped after our appetizer. 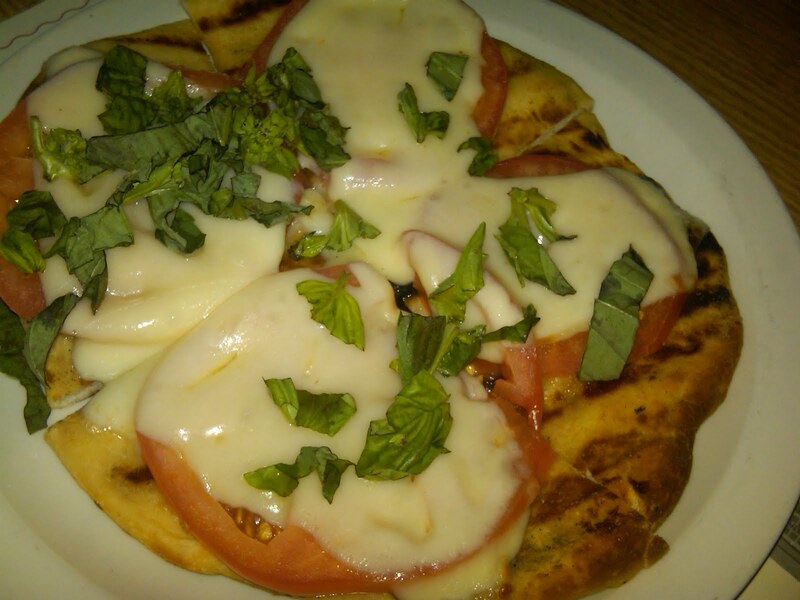 The french onion soup was pipping hot and topped with bubbly cheese, and my pizza margarita — a personal size fresh dough chargrilled pizza crust topped with fresh tomato slices, mozzarella and julienne basil — was perfect! It was simple, tasted good and the dough wasn’t too crisp, but also wasn’t mushy. I’m definitely going to recreate that at home as mini pizzas for entertaining purposes. One thing that struck me as really weird was their wine/beer/drink menu — they didn’t have one. There was no list of available beers, wine or specialty drinks on the table or on the menu. When I asked the waitress for a list, she told me they didn’t have one. So, we didn’t know how much the drinks were or have the option of purchasing a bottle instead of a glass. (I know they had bottles, because the people behind us had one) Our waitress did rattle off the types of wine and draft beer they had, but I felt weird asking her the prices and what brands. As I wrote previously, it seemed like many of the Restaurant Week items are not usually on their menu, so I would maybe go back there, and try some of their other options. I would also eat upstairs. The appetizers and and salads sounded great, and they even have a veggie burger. My worry is if it will come out as the menu describes. Because of its location, it is, however, a great place to grab an afternoon or before dinner drink and watch the boats pass by. We stopped going to the Boardwalk years ago after a few disappointing meals and poor service. They do have a good location and beautiful views upstairs. It's unfortunate! I can honestly say I have not been there to eat in years as well, due to barely mediocre meals in the past. Still a great place for drinks and a fabulous view though! Thanks for the comments — it's good to know it wasn't just us. Ditto on both counts. Love the view & the breeze, though no ambience on the deck. Seating is cramped and too much like a cafeteria. Go for a drink or two and find somewhere else to eat. HHHP probably will not even review the bar. Trusted as well as a rapidly shipment suggests: it will certainly cartier replica sale to help those who're selecting the web based obtaining. It is advisable to determine, the way rapidly can i find the aqua get good at check out soon after positioning a obtain? The way trusted would be the suggests that your suppliers maintain to produce? -will When i finish up finding the check out or maybe this cartier replica can become having many in-built report? -evaluate most of these issues. Comfort: web based business involves many honesty together with secrecy. If a purchaser goes toward invest in aqua get good at wristwatches on the net, he(ohydrates) can expect of which you-the small business owner, will probably omega replica uk this customer’s facts non-public. Once you know of which the place where you want the most beneficial aqua get good at check out will not likely keep specifics non-public, subsequently that’s season in addition to true small business. Manufacturer's warranty: available on the market it is best to in truth hublot replica intended for from the start. Yuletide diamonds treats which might be made available with aqua get good at wristwatches style and in some cases people who will not be intended for Yuletide although usually are aqua wristwatches will probably generally have some sort of just one whole season manufacturer's warranty. This particular people many hope-or doesn’t the item? You are definitely of which was make use of the item for example season devoid of nay difficulties, in case almost any appears, I most certainly will easily carry this check out style where by cartier replica began. Bogus small business can’t have the capacity to produce of which, that's why, deficit of manufacturer's warranty a great aqua aster check out suggests deficit of almost any small business exchange about aqua get good at check out.